​ DENTON - The allure of the Hwy. 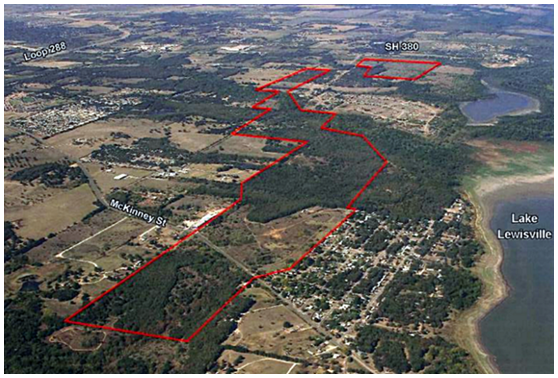 380 corridor finally paid off for the patient owners of 444 contiguous acres of Lakeview Ranch, an existing single-family development in Denton. Canyon Energy Partners, a West Texas energy company, had patiently owned the property for ten years waiting for the market to heat up. Lakeview Ranch, south of Hwy. 380 along Lakeview Blvd., could previously not get any traction because of its size and the fact that it was between the southern Denton market and all of the single-family activity to the east of Hwy. 380. As the other surrounding tracts were developed and the price per acre began rising quickly to historical highs, Lakeview Ranch became more desirable. The new owner, FSA & S Collin County, plans to not only market the tract in its entirety, but to have the ability and desire to sell pods and be creative with the tract. The land is zoned residential by the City of Denton with specific allowance for 40-, 50- and 60-foot single-family lots.